"In Latin America the state is the prime regulator, coordinator, and pace-setter of the entire national system, the apex of the pyramid from which patronage, wealth, power, and programs flow. The state bears responsibility for the realization of civic needs, providing goods and services to each citizen. Doing so requires the exercise and maintenance of social and political control. 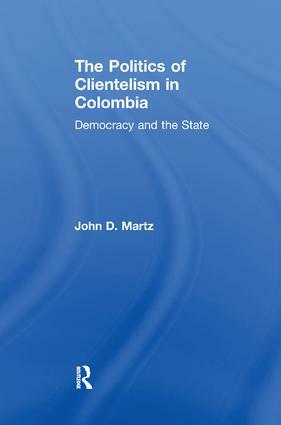 It is John Martz's contention that clientelism underlines the fundamental character of Latin American social and political life. As the modernizing bureaucratic state has developed in Latin America, there has been a concurrent shifting away from clientelistic relationships. Yet in one form or another, political clientelism still remains central.Clientelism occurs when large numbers of low-status individuals, such as those in the slums of rural and underdeveloped areas, are protected by a powerful patron who defends their interests in return for deference or material reward. In Colombia the rural patron has become a member of the higher clientelistic system as well; he is dependent on a patron who operates at the national level. This enables urban elites to mobilize low-status clients for such acts as mass demonstrations of political loyalty to the regime. Thus, traditional clientelism has been modified through the process of modernization.Part One of The Politics of Clientelism examines Colombian politics, focusing on the incarnation and traditional forms of clientelism. Part Two explores the policies of Colombian governance, from the administrations of Lleras Camargo through Julio Cesar Turbay Ayala. Part Three discusses the modernization and restructuring of Colombia in recent decades under Belisario Betancur, Virgilio Barco, and Cesar Gaviria.As the modernizing bureaucratic state has unfolded, there has been a similar shift in many clientelistic relationships. Martz argues that, whether corporate clientelism remains or more democratic organization develo"